Yuki and I have heard about Bali for a long time. It's a small little paradise close to Taipei city, across the river from Danshui. 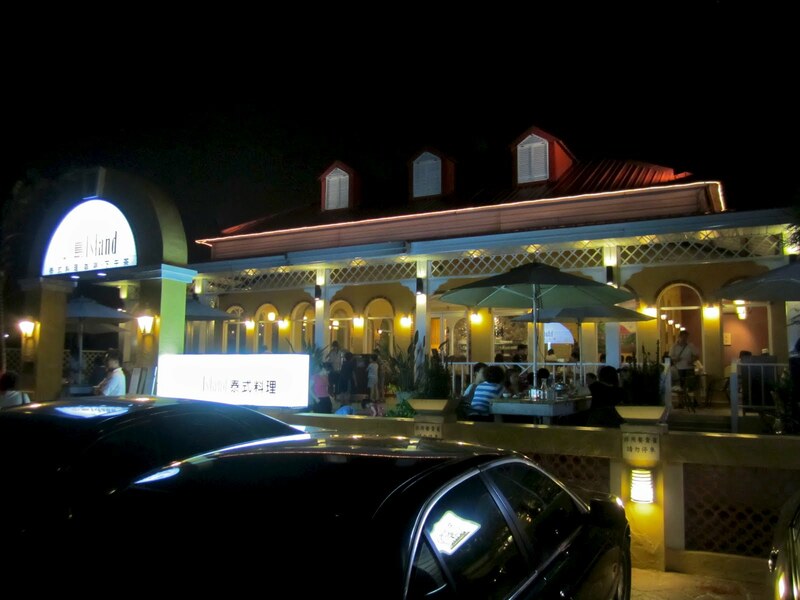 Similar to Bali, Indonesia in atmosphere, which makes it a very popular spot for the Taiwanese. It's very convenient to get to, via MRT and a ferry across the river. Despite this, it took us a while to find the time to get there. So today, in the afternoon we headed over to Danshui and quickly onto the ferry. Once in Bali, you notice a huge difference in atmosphere and you really feel like you've just been whisked away to Indonesia. With palms trees, bicycles, beaches, boardwalks, street food, music, celebrations and rows of sea side restaurants with a view. We immediately went to the generous City funded bike rental. Still about $30NT per person per hour. We rode through town all the way to the Shihsanhang Museum of Archaeology (十三行博物館). It's far away from the main street of Bali, but Yuki is a fan of architecture and interior design, so i'd thought it be of interest. It's a very unique building, in addition, the museum inside is all free of cost. It's small though, it only took us 30 minutes to walk through. It also has a nice grand deck outside facing the river where Yuki and I enjoyed the sun set. The bike rental closes at 7:30pm so we had to ride back to town to return them and find some dinner in Bali. Walking along Renai street (仁愛路) there are several nice cafe's and restaurants to choose from. First was Island (小島泰式料理) a Thai restaurant with a cool bahama design to the patio and interior. Next was Skiff (小艇) a small two story greek looking atmosphere with a tropical patio and roof top tables. Finally was Badasan (芭達叅原住民主題餐廳) a two story elaborately decorated Taiwanese aborigine themed restaurant. They had loud music and it was packed full of customers. Definitely one of the more popular spots. Seems the average cost of most of the restaurants are around $300-400/person. There are a lot more restaurants we failed to explore, so don't think there's only three to choose from. So in the end, we chose the Thai restaurant...Island. 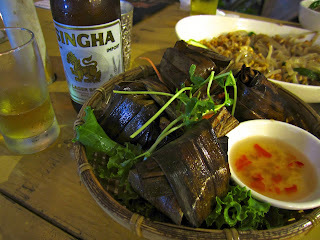 We had Pad Thai, grilled chicken wrapped in bamboo leaves and a bottle of Singha (Thai beer). The chicken was the best. Smokey and slightly crispy. With the great food, bahama atmosphere and beer, it was a very relaxing escape from the bustling city of Taipei. I love Taiwan, it has soo much to offer. Further more, I hear there's even Green Island (錄島) and Orchid Island (蘭嶼), which is even more of a tropical paradise similar to Hawaii but without the higher cost. I'll have to visit those in the future :). I have pictures from my film camera but it'll take a while before they're developed.